The X1 Digiscoping Adapter from Leica combines a Leica X1 camera with a Leica spotting scope creating an extremely high-performance system. 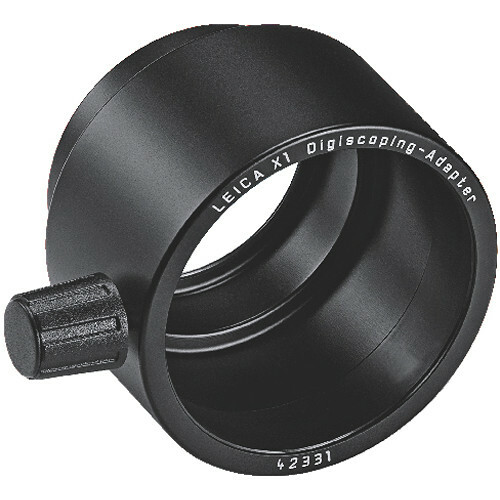 The X1 Digiscoping Adapter is machined to the wider diameter of Leica's 25-50x WW eyepiece which is available on the LEICA APO-TELEVID 65 and 82 spotting scopes. The adapter is simply screwed into the filter thread of the Leica X1 and locked in place at the spotting-scope eyepiece with a bolt. No other adjustments to the camera are required.